IOCL Apprentice Recruitment 2018: Indian Oil Corporation Limited (IOCL) has published the Recruitment Notification to fill up the 345 Trade & Technician Apprentices posts. The IOCL Apprentice Recruitment 2018 Online Form has been released on 1st September 2018 and applicants are informed they must complete the Application form on or before the last date which is 21st Septmebr 2018. 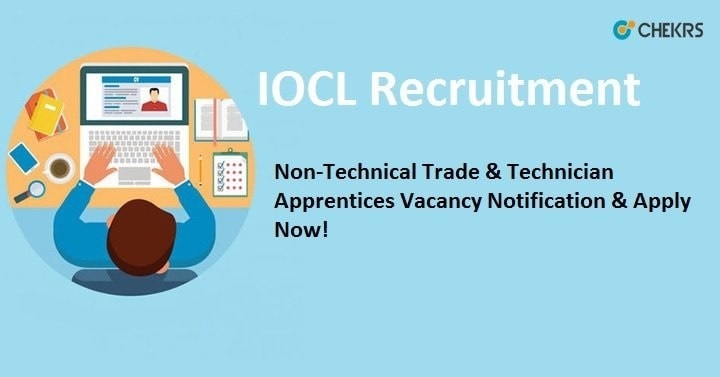 Interested candidates can read the IOCL Trade Apprentice Vacancy 2018 Notification carefully and can check the eligibility, Age Limit, Selection Process etc for IOCL Apprentices from here. Age Relaxation will be applicable for reserved categories. Go to The Official Website of IOCL. Click on the Career Button. Southern Region (Marketing Division)18 Link. Click on the Online Application Form Link. Fill the Online Application Complete details. Upload the Scanned Copies of Documents, Photograph, signature and other required documents. After complete the online form, candidates can take print out of application form for further uses. Remarks: To receive more updates on Latest IOCL Apprentice Recruitment 2018 stay tuned to our site www.jobs.chekrs.com and we will update you the latest news alert in regards to details of various Government Job Posts 2018. You can also send your valuable comment in our commenting section below and we will get in touch with you shortly.